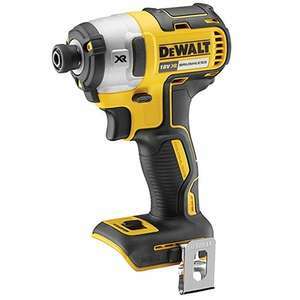 DOES WHAT IT SAYS ON THE TIN, BARE TOOL DEWALT IMPACT DRIVER WITH 3 SPEED/TORQUE SETTINGS INCL. VARIABLE SPEED TRIGGER , but extra control on setting 1 for easy soft start. 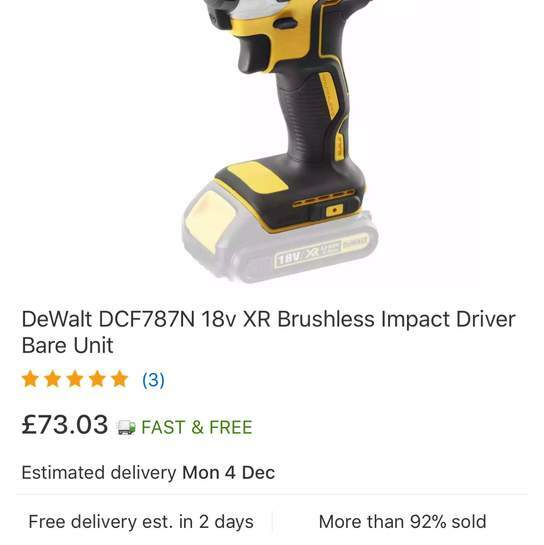 Better deal imho than the DCF878 posted a few days ago, even though its cheaper, as its only single speed/torque setting. Brushless & XR too - nice. Can grab the non brushless for £65 on eBay and brushless for £80 . For the past 2 years . Don’t need to post a link as there are so many !!!!! Can grab the non brushless for £65 on eBay and brushless for £80 . For the …Can grab the non brushless for £65 on eBay and brushless for £80 . For the past 2 years . Don’t need to post a link as there are so many !!!!! Its got over 200 Nm of torque. I think you need 3 torque settings on such a powerful tool unless you use your tools for breaking rather than making! Yes guys it’s a slightly different model . Still drives 100mm 12s screws not problem . And still has dewalts same guarantee . Yes guys it’s a slightly different model . Still drives 100mm 12s screws n …Yes guys it’s a slightly different model . Still drives 100mm 12s screws not problem . And still has dewalts same guarantee . Heat given excellent price much more usefull than the previous models. So I've effectively got the twin kit for £270, albeit with the lesser capacity 2 x 2Ah batteries. The batteries should be sufficient for my needs as I'm only a DIY'er. In fact, I don't actually even need an impact driver or such a powerful drill.